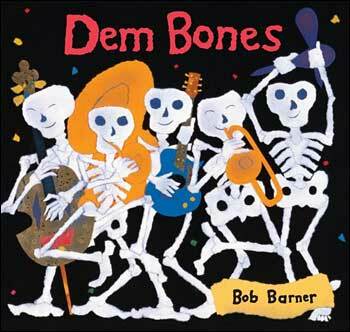 Dem Bones is an exploration of the human skeletal system, using the well-known folk song 'Dem Bones.' Each spread is devoted to a line of the song, with the featured bone highlighted in red and relevant information about that bone clearly explained. We agree with Publisher's Weekly, who called this book a "clever anatomy lesson." The song is most likely familiar to many students and teachers, but this book adds a fun, Day of the Dead twist with colorful collages depicting a funky skeleton band, each made from cut and torn paper. To avoid disrupting the rhythm of the text/song, you will probably want to read this book through twice. (It's short!) The first time, maybe just read the words of the song and show the great collage art. Then, on the second round, you can read the descriptions of the bones. Descriptions talk about the movement of the bone, so in the second read through you could have the students make the movement themselves. Sample Pages: Below are sample spreads from inside this book. Each spread focuses on a part of the body, lists the verse from the song, and includes a short paragraph about the bone being featured---in this case the neck bone. See what we mean about the fantastic collage illustrations and the Day of the Dead look! Combine a little art with a little science in this fun project that has kids making a skeleton out of yarn and then labeling the parts of the skeleton. This project is easily adjusted to fit the level of your students, but regardless of the age, the results are fun and fabulous. -Cut out strips of white yarn and glue them on as the bones. It can be simple for younger students and more detailed for older students. -Write the different bone parts on the small strips of yellow paper and set them down around the exterior of the skeleton. -Using the red yarn, connect the bones to the yellow label. Once all the labels and yarn is set in place and fits, they can be glued down. ***The last spread of the book has a big skeleton laying on its side with all the bones labeled. 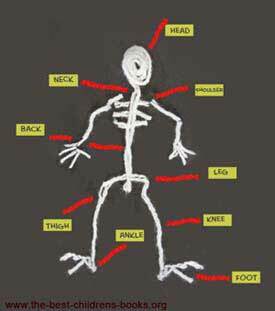 Use this page for students to refer to when labeling their skeleton.